There are several other ways to save; give us a call at (313) 388-0100 and ask for details. •Or use EZ Pay and have your payment automatically transferred from your bank account each month on the day you select. Additional Coverages to Protect You. Coverage against sudden and accidental loss due to a collision , fire, windstorm, landslide, vandalism and other perils. Total Loss coverage that Counts. This optional coverage replaces your RV if it is damaged beyond repair. It’s protection against depreciation. When a RV is protected for its actual cash value, a claim settlement for a total loss sometimes isn’t enough to pay off an outstanding loan. 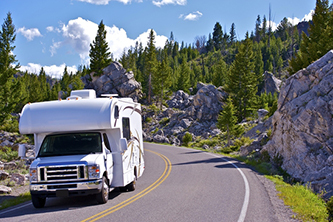 This optional coverage ensures you’re not left with a loan to pay and no RV to show for it. Our insurance companies will work with you to determine how much your RV is worth, and insure it for that amount. If you suffer a total loss, you’ll be reimbursed for that agreed amount- no depreciation! This elective coverage lowers your deductible each year you remain claim-free. Be a safe driver and within a few years you have have a zero deductible! Motor home owners can protect their personal belongings with either actual cash value or replacement cost coverage. You won’t need a separate service plan when you add this optional coverage to your policy. Whether your RV breaks down, you run out of gas, or you simply lock yourself out, call a toll free number for assistance. Optional protection that pays your temporary housing expenses, plus the cost to get you and your RV back home. Provides premises liability coverage while parked at a campsite or RV park. We can provide liability protection, similar to a homeowner’s policy. Full coverage policies automatically receive up to $2,000 in coverage. You can also purchase additional protection if your trailer is valued over $2,000.